We come to your location rain or shine, indoor or outdoor. You Have Options on Picture Day! Athletes can elect to upgrade to one of our BREAKOUT backgrounds. In addition to the natural background, each sport has 3 background design choices. Athlete has a choice of a standard or one of our exciting breakout backgrounds. Indoors we use the latest trending "white screen" photography techniques to create truly unique sports portraits. More on Extreme Portraits. Athlete has a choice of a standard or a breakout team photo. With the three Team Photography options we offer, picture day can proceed rain or shine! 1. Traditional Risers outdoors when you want to show off your home field. 2. Player can upgrade to the Breakout Team Background option - shot outdoors. 3. Extreme Team shot indoors. The Extreme Team (3) is photographed indoors utilizing the latest white screen technology to create a one of a kind virtual team composite! It is the simplest and quickest option leaving more time for coaches and players to practice. More on our Extreme Teams. 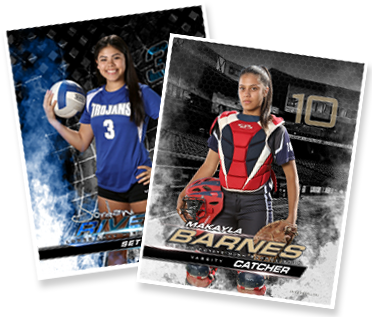 Large team vinyl banners - Contact MVP to plan your special photo session.